Unless clearly contradicted below, general pocket billiards rules of play and etiquette apply to One Pocket, and complete General Rules are available from the World Pool-Billiard Association (WPA). Common ‘house rule’ variations are noted in italics. One Pocket is a game for two players or two teams, where each player or team can only score into one of the two corner pockets on the foot end of the table, while the other player or team can only score into the other corner pocket at the foot end of the table. The other four pockets are neutral pockets, and any balls pocketed in a neutral pocket are spotted at the end of the shooter’s inning. There is no requirement to ‘call your shot’ in One Pocket, and no special order or significance to any numbered object balls. The first player (or team) to legally score eight balls into their own pocket wins the game, whether they pocket their game-winning ball by their own shot, or as a result of their opponent’s shot. The game may be handicapped either by agreement between players or as designated by a tournament director. Standard handicaps are created by adjusting the required winning score for either one or both players, either for all breaks or for specified player's breaks. Please note that with One Pocket's long tradition of after hours play, many other creative variations in handicapping have been invented over the years. As long as all those involved agree before play begins, virtually everything is negotiable in after hours contests. 2.1 All fifteen balls are tightly racked in no particular required order in a standard triangle with the apex ball placed as nearly as possible on the foot spot. In tournament play, players lag for the first break. For games that follow, the break alternates back and forth between the players, regardless of who wins each game. Prior to breaking, the breaking player selects one of the corner pockets at the foot of the table as their own, thus the opponent is assigned the other foot pocket by default. In subsequent games, whoever breaks is free to change their pocket selection on their own break. In standard practice the breaker does not 'call his pocket'; their pocket selection is considered obvious by virtue of the orientation of their break. Players employing an unusual break are advised to make their pocket selection clear prior to the break, to avoid conflict. Traditionally opponents rack the balls for the breaker, with the breaker having option to inspect the rack and ask for a re-rack if they are not satisfied with the quality of the rack. In current tournament play, players may rack their own balls, with the opponent having the option to inspect the rack. 'Racking your own' is recommended at all times, to reduce racking complaints. In a handicap situation when one player or team is awarded the break in every game, unless otherwise agreed, they should break towards alternate pockets on alternate breaks. 2.2 The opening break begins with ball in hand behind the head string. On the break, the cue ball may contact either a cushion or any ball in the rack first, but in either case, after contacting at least one ball, an object ball must be pocketed, or the cue ball or at least one object ball must contact a rail, otherwise it is a one foul penalty. As long as a legal stroke is employed from behind the head string on the break, the incoming player must play the balls where they lie – there are no re-racks for a pocket scratch or failure to contact a cushion or pocket a ball on the break. 3.1 A player’s inning continues only as long they pocket a ball or balls in their own pocket on a legal stroke. While it is perfectly legal to pocket a ball in a neutral pocket or in the opponent’s pocket, doing so does not entitle the shooter to continue their inning, unless on the same stroke they legally pocket a ball into their own pocket. Any balls pocketed either accidentally or intentionally into the opponent’s pocket are counted for the opponent, unless on the same stroke, either the cue ball pocket scratches or jumps off the table. 3.2 In the event that a player pockets both their own game winning ball, and their opponent’s game winning ball, both on the same legal stroke, then the shooting player wins. There are no ‘ties’, and it does not matter which ball drops first, as long as they both drop as a result of the same stroke. There is no option to ‘call a safety’ in One Pocket; if a player legally scores a ball into their own pocket they must shoot again, unless the game is over. Players may play safe to the same rail as many times as they wish, as long as either the cue ball or at least one object ball is driven to a cushion after the cue ball contacts an object ball. Standard ‘frozen ball’ rules apply to safety play. Players may use jump shots in One Pocket as long as they are performed with the player's own standard playing cue using legal jumping techniques as defined in General Rules. Specialized jump cues are not permitted in One Pocket. Please note that many players, poolrooms and tournament directors have differing opinions on specialized jump cues. It is recommended that players check with their opponent, the 'house man' or the tournament director prior to an important match to come to agreement on whether specialized jump cues shall be permitted or not. 6.1 Unless otherwise announced by the tournament director, One Pocket is played according to the World General Rules 1.16.1, ‘cue ball fouls only’. In the event that a player accidentally moves a ball, the opponent may elect to have the disturbed ball remain in its new position or be restored to its original position. When balls are restored, they shall be placed as close as possible to their original positions, with no advantage to be gained by the offending player. If no official is available to restore disturbed balls, then the players must come to agreement on satisfactory replacement of the disturbed balls prior to continuing play. 6.2 Any scratch or foul results in the end of the shooter’s inning, as well as a standard one ball penalty. All balls pocketed in the shooter’s pocket as a result of a stroke that includes a foul do not count for the shooting player and are to be immediately spotted, along with the standard one ball penalty. Also, any balls pocketed in the opponent’s pocket on a stroke that ends in either a pocket scratch or with the cue ball off the table are not to be counted for the opponent, and are to be immediately spotted. However, on a stroke when any other foul is committed (such as a push shot, double-hit or illegal ball contact), any balls scored into the opponent’s pocket are to stay down and be counted for the opponent. 6.3 Following either a pocket scratch or the cue ball jumping the table, the incoming player has cue ball in hand behind the head string. Following any other foul, the cue ball is played where it lies. 6.4 If the offending player has no balls to spot, then they will owe one for each such scratch, which must be repaid by spotting at the end of the first inning or innings in which they score. All owed balls must be repaid before any pocketed balls count towards a player's game score. Typically, any owed scratches are indicated by placement of a small coin on the rail top adjacent to the offending player's pocket. An additional coin is placed to represent each additional scratch without a scored ball to spot. One coin is removed for each owed ball repaid by spotting at the end of the first inning or innings in which they are scored, until all owed scratches have been repaid, and standard scoring can commence. 6.5 Driving either the cue ball or an object ball off the table is a foul, whenever either comes to rest off the playing surface, or comes in contact with anything other than the table itself while airborne. 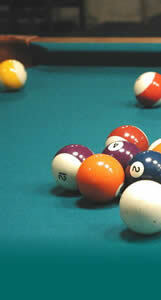 Please note that One Pocket has been traditionally played in many areas without a foul charged for jumping an object ball off the table, contrary to current general pocket billiards rules; therefore it is important to verify house rules or your tournament director's interpretation prior to an important match. 6.6 Intentional fouls are an accepted part of One Pocket tactics as long as they are played by use of a legal stroke, such as by lightly touching the cue ball with the cue tip; by rolling the cue ball to a new location without regard for legal contact with either an object ball or a cushion; by pocket scratching the cue ball; or by using a legal jump technique to force the cue ball off the table. However, if the acting official rules that a player has used an illegal technique to direct the cue ball or any object balls to a more desirable location, then the incoming player has the option of either playing the balls where they lie, or requesting the official to restore all such moved balls to their location prior to the illegal maneuver. The offending player is charged the standard one ball foul penalty, and in addition may be further penalized at the discretion of the acting official under the general rules of unsportsmanlike conduct. 6.7 It shall not be a foul to accidentally touch the cue ball while removing an object ball from an adjacent pocket, or when spotting a ball where the cue ball interferes. It shall be a foul for the incoming shooter to accidentally touch an object ball with the cue ball while placing it in a ball in hand situation. Three consecutive fouls is loss of game, however the opponent or tournament referee must notify the player that is on two fouls, prior to their third foul. Should no notice occur until after the shot resulting in the third foul is in motion, it is not immediate loss of game, but the player will be considered to be on two fouls for their next shot. The three fouls rule is often waived in after hours situations by agreement between the players. For a foul to result from failure to legally strike a rail after contacting a frozen ball, the ball in question must be inspected and designated as frozen prior to a player’s shot, otherwise the ball is not considered frozen. If the cue ball becomes wedged between an object ball and the cushion and frozen to both, then legal shot requirements must be met by pocketing the frozen ball, or by contacting either another ball or another cushion enroute to a legal shot. Failure to do so is a foul. 9.1 Balls are to be spotted on the foot spot, or in a direct line below the foot spot, and tightly frozen to other object balls that fall in or interfere with that line. However if the cue ball interferes, the spotted ball is to be placed on that line close to, but not quite frozen to the cue ball. In the event that the line below the foot spot is full and the bottom rail interferes with a spotted ball then balls are to be spotted on the same line, but above the foot spot. 9.2 Any penalty balls owed by the shooter, or balls pocketed in a neutral pocket, are to be spotted at the end of the shooter’s inning. However, if a player runs off all the balls on the table without reaching a winning score, then all such balls are spotted immediately (all at once, not one ball at a time), and the shooter continues their inning. At no other time in One Pocket are balls spotted during any shooter’s ongoing inning. 9.3 In the event of a handicapped game with the combined winning ball count needed by the two players or teams totals greater than sixteen at the start of the game, then the player going to the longer count must spot the first ball or balls they score, immediately at the end of the first inning in which they score, as necessary to bring the combined winning ball count back down to sixteen, at which point the game continues in standard fashion. 9.4 If any owed balls, or balls that have fallen into a neutral pocket are forgotten and later remembered, then instead of being spotted after the current shooter’s inning, they are spotted after the end of the next player’s inning, unless there are no balls left on the table, in which case they are all spotted immediately. In any case, any owed balls are not forgiven, but still must be paid. In practice, forgotten balls may be spotted at any time after they are remembered, as long as both players agree on the timing; if either player objects to an earlier spotting, then rule 9.4 should be followed. Please note that playing ‘snooze you lose’ is the rare exception in house rules; it is by no means the standard rule, and it should only be accepted when it is clearly and mutually agreed on by both players before play begins. 9.5 In the event of a scratch with the offending player having no balls to spot when all of the balls are located behind the head string, the ball nearest the head string may be spotted at the request of the incoming player. If two or more balls are equally close to the head string, the highest numbered ball would be spotted. 10.1 It is the responsibility of the shooting player to verify their own ball count as they approach their out ball, and the non-shooting player should avoid making comments about how many balls are needed. However, if the non-shooting player disturbs the balls, or breaks down their stick, or in the judgment of the acting official otherwise significantly disturbs the shooter in the assumption that the shooter is already out, such acts are considered a concession, and the shooter is considered to have won, regardless of whether a subsequent count reveals that more balls are needed. Likewise, if it can be verified that the non-shooting player’s mistaken statement of the number of balls needed leads directly to the shooter pocketing said number of balls and the assumption of the game being over, then the shooter wins, even if it is subsequently determined that the non-shooting player’s statement of balls needed was in error. 10.2 If the shooting player disturbs only one of the remaining balls on the table under their own mistaken assumption that the game is over, play continues under the terms of rule 6.1. However, if the shooting player disturbs two or more of the remaining balls in play on their own mistaken assumption that the game is over, then it is the shooting player that forfeits the game. Players should refrain from moving or removing balls from their opponent's pocket or scoring tray for any reason, except to spot a ball following a scratch or to sufficiently clear a pocket to permit entry of additional balls for an impending shot, and should only do so with respect for their opponent's scoring preferences. 11.1 It is each player’s responsibility to keep track of which pocket is theirs; opponents are under no obligation – other than good sportsmanship -- to correct such an error prior to an opponent’s shot. A ball legally pocketed in the wrong pocket counts for the player who legitimately has that pocket, regardless of who shot the ball. However, a ball shot into the wrong pocket does not entitle the shooter to continue their inning, unless on the same stroke they legitimately score into their own pocket as well. 11.2 In the event that a player shooting into the wrong pocket is permitted to continue the same inning at the table (beyond what is entitled by legally pocketing a ball in their own pocket) by their opponent’s or the referee’s failure to notify them of their error, such failure of notification does not legitimize any additional balls pocketed in that inning, whether pocketed in the shooter’s pocket or their opponent’s pocket. Thus the first shot to the wrong pocket in a given inning is the shooter’s responsibility, and the shooter’s opponent is entitled to any balls pocketed on that first stroke. However, any subsequently pocketed balls in the same inning are to be spotted as illegally pocketed balls, because it is the referee’s or opponent’s responsibility to notify the shooter before they erroneously continue their inning. 12.1 Unless a referee is assigned, players shall be responsible for refereeing their own match. Whenever the players themselves can come to an amicable agreement on any scoring or officiating issues to their satisfaction, and play continues, their decision shall be deemed final. If at anytime in a match either player anticipates a close call, or would like a neutral party to spot a ball, or wishes to have an official ruling in any conflict, then an official should be called. The non-shooting player bears extra responsibility to call an official if they anticipate a close call. In the event of any ‘too close to call’ situation, arbitration should favor the shooter unless there is verifiable mitigating evidence in the judgment of the official. In the event of a disagreement over a contested ball, with no evidence in the judgment of the official to warrant crediting the ball to either player, then the contested ball shall be deemed a neutral ball, and spotted according to rule 9.4. If there is no tournament official, then the ‘house man’ or another mutually agreed on impartial observer should be summoned to arbitrate. Their decision should be considered final. *OnePocket.org would like to acknowledge the Billiard Congress of America for their basic One Pocket rules, and Grady Mathews, for his “Grady’s rules” wherever their influence appears in these expanded rules.